The PS-RDN20 is a 20A redundancy (buffering) module for a 24 Vdc power system. Containing 2 sets of 20A OR-ing diodes, the PS-RDN20 gives you a new option for safe connection of 1+1 redundant power supplies. Not only does it provide the buffering and decoupling for redundant power supplies, the PS-RDN20 also provides alarm signals for both input channels through the built-in alarm relays. 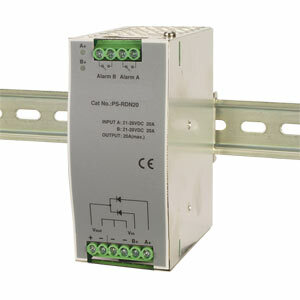 Now you can replace a failed power supply without interruption to your control system. Note: Power supplies not included. Order separately.